Dar Lighting Austin 3 light floor lamp features a domed base and a tall, slender stem that supports three swirling, arms that create a stylish and contemporary image. These arms are topped with clear glass, cubed shades with frosted inners that add a soft and warm touch that is offset by the sleek, polished chrome finish. 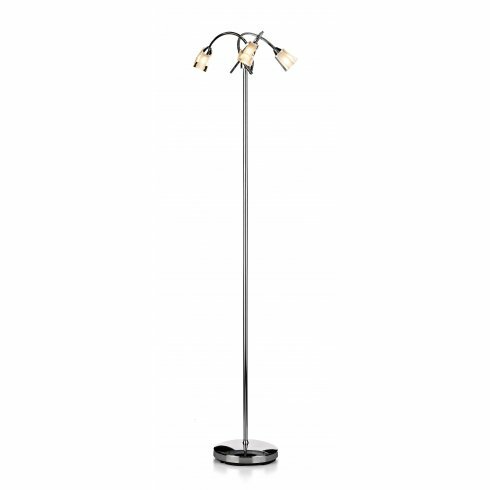 The product code for this Dar floor lamp is AUS4950. Operated by a foot switch for ease of use. Please see our website for the entire Austin range which includes 3 and 5 light semi-flush ceiling fittings, a 2 light wall fixture and a table lamp. Many of these items are also available in black or satin chrome finishes and all are available to order direct from our website.